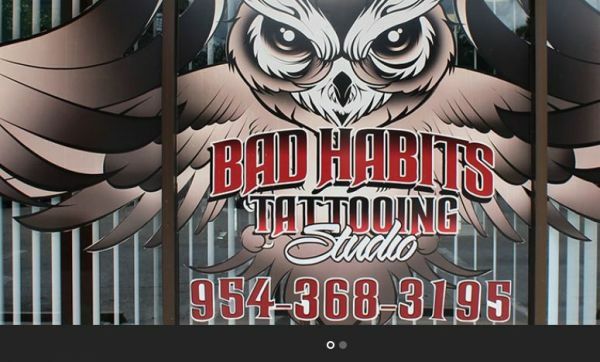 Bad Habits Tattoos is a South Florida custom tattoo studio in the heart of Fort Lauderdale serving all of the Dade, Broward, & Palm Beach Counties! Giving all of our customers, nothing but the most professional and hygienic experiences for their bodies. This is our commitment and you can expect nothing less from us! Specializing in Abstract, Black & Grey, American Traditional, New School, Cartoons, Asian, Oriental, Yakuza, Color, Cover Ups, Reworkings, Fine Line, Realistic, & Portrait style tattoos. Come visit the best tattoo shop in Fort Lauderdale, Florida, complete with top artists providing the finest quality of artistry in ink.